It is also possible to add video or audio content to the website. We don't have the capacity to host video, so it will need to be uploaded to a video-specialist website such as YouTube or Vimeo, before it can be added to this site. Both YouTube and Vimeo are free to use. To add a video or audio clip, click the ‘add entry’ button and then select ‘media’. 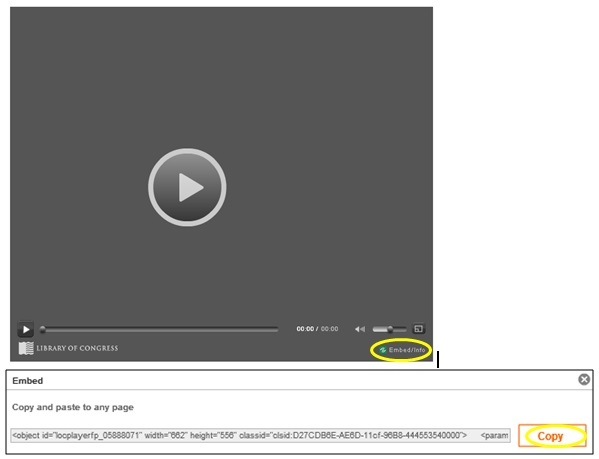 Click the ‘embed’ button and then select the website where your video or audio clip has been uploaded. There are currently four options: YouTube, Vimeo, EAA (Experimental Aircraft Association) and the Library of Congress. The next step will differ depending on which website you choose. If you are linking to video or audio clips from YouTube, Vimeo or the EAA, simply paste the webpage’s URL from the address bar at the top of the video's page into the box provided. 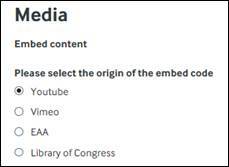 If you are adding video or audio clips from the Library of Congress, you will need to obtain an ‘embed code’ which can be found by clicking the ‘Embed/Info’ button in the bottom right of the video player and then clicking ‘Copy’. You can then paste this code into the box provided on the upload page, as above. If the video or audio clip is part of a collection, or you want to add several clips and keep them together as a collection, then write a collection name in the box provided. In the caption box, give a brief description of the video or audio clip. If you know it, include information like where and when the video or audio clip was recorded and by whom. If you know the names of the people, aircraft or places recorded within the video or audio clip then include this information as well. 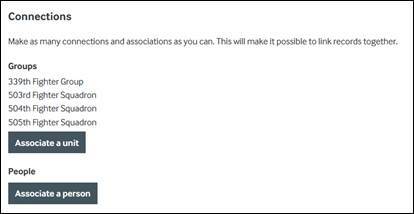 Next, try and link your video or audio clip to as many different records on the website using the ‘associate’ buttons in the ‘connections’ section. Try to link the video or audio clip to the pages of the people, places and aircraft which are recorded. If you can’t find the records you are looking for, it may that they haven’t yet been created on the website. You can create new records yourself, using the ‘add entry’ button. It is best to do this in a separate tab or window, as leaving the video or audio clip upload page before you click ‘save’ could mean that you lose all of the information you have added.